In a four hundred square foot studio in Red Hook, the hinterland of Brooklyn, a botanist, an engineer, anthropologist and bike messenger mental away the hours putting the finishing touches on a bicycle that could save the world. Okay, maybe not the whole world. Perhaps not even a block of it. And twenty-somethings Justin Aguinaldo and Sean Murray would probably never refer to themselves as an anthropologist and botanist even though bike messenger Aguinaldo majored in anthropology in college, and Murray once taught the plant science to children with learning disabilities at the Churchill School in Manhattan. 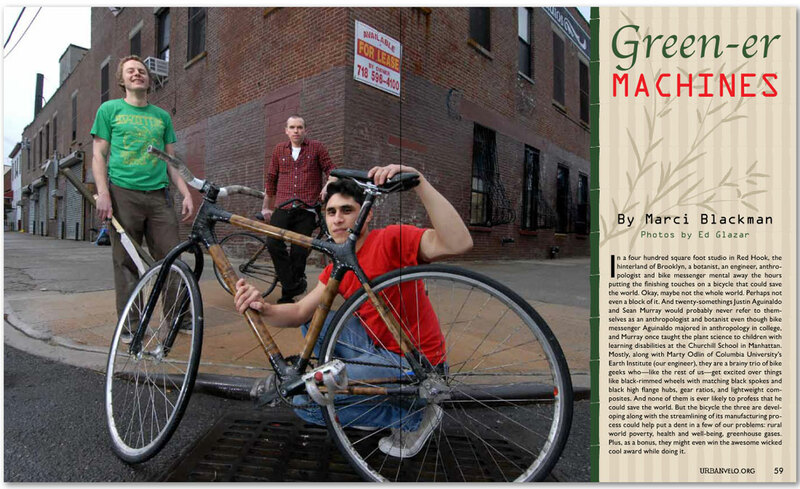 Mostly, along with Marty Odlin of Columbia University’s Earth Institute (our engineer), they are a brainy trio of bike geeks who—like the rest of us—get excited over things like black-rimmed wheels with matching black spokes and black high flange hubs, gear ratios, and lightweight composites. And none of them is ever likely to profess that he could save the world. But the bicycle the three are developing along with the streamlining of its manufacturing process could help put a dent in a few of our problems: rural world poverty, health and well-being, greenhouse gases. Plus, as a bonus, they might even win the awesome wicked cool award while doing it.